If it hasn’t already, the Google van may be coming soon to your neighborhood. Huntsville has never been the kind of place to wait around for technology to make its way here. Sure, in many ways, Huntsville is still a traditional Southern city with long, hot, sultry summers and a penchant for football rivalries and ice-cold beer. But make no mistake – Huntsville’s pluck and grit is writ in rocket flames. Never mistake a slow way of talking for short-sighted vision. That was made clear back in 2012 when Google Fiber sent out its initial call to cities across the nation, interested in partnering with the technology giant to build a high-tech fiber network worthy of bringing gigabit internet service and Voice-over IP telephone services to the Tennessee Valley. When all the entrants, including Huntsville, were thrown into the hat and a select few cities were chosen, Huntsville wasn’t among them. If in 1956, the Redstone Testing Center had given up the first time a missile disintegrated on a test stand, Malawi may have put men into space before Huntsville! According to Lauren Johannesmeyer, city manager for Google Fiber, Huntsville city leaders know something about executing a mission and Harrison Diamond, then the director of project management at the Huntsville/Madison Chamber of Commerce, was on a mission. “I remember back as early as 2013, Harrison (now the business relations officer for the City of Huntsville), had a vision for what a gig city looks like,” said Johannesmeyer. “Between the Chamber of Commerce, Huntsville, and Huntsville Utilities, they basically said, ‘We’re going to build the network anyway’. That initiative makes Huntsville a one-of-a-kind model for Google Fiber, the only city in the country where a utility company is constructing the network rather than Google Fiber. Huntsville Utilities is just short of midway through the build and right on schedule. Construction consists of a fiber ring that encircles Huntsville to make it easy to branch service off into neighborhoods. The ring is divided into six fiber huts off which Huntsville Utilities connects the local Google Fiber network into the Internet backbone and the worldwide web. 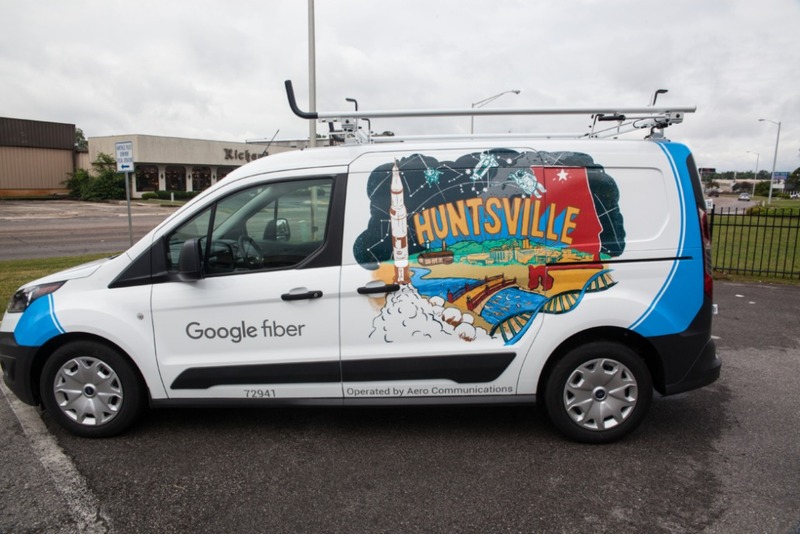 “Huntsville Utilities manages and maintains the core ring that wraps around the City, and Google Fiber owns and manages the network from the point of access at the street, up to the customers house or business,” Johannesmeyer said. “Right now, in terms of serviceable areas for us, there is what I call a pizza slice-shaped section in north Huntsville. It was our very first opening on May 23, 2017. Gerhdes added, “We started with the Chase Hut north of Winchester Road to Pulaski Pike because the Chase area power distribution center in northeast Huntsville was a great place to start. He said the Triana Hut will service most of the core of downtown Huntsville including Blossomwood, and the utility is readying the 911 Hut near the Madison County 911 Center and Wynn Drive. The final construct will be the Jetport Hut at the western edge of Huntsville. The entire fiber network project is scheduled for completion in 2020. Construction is always subject to change with many variables impacting schedules, but Google Fiber’s current contract with Huntsville Utilities is to service addresses they turn over to them as the ring expands within the Huntsville city limits. The lease agreement is not exclusive so other companies can lease out fiber on that ring as well. In terms of what Google Fiber has to offer customers, its services include 100 MB or 1,000 MB (gigabit) fast residential internet options; traditional television services with 220+ channels that can be combined with their internet offering and Wi-Fi extenders; and a Voice-over IP (VoIP) phone service solution that uses the internet rather than traditional hardwired landlines. Currently service to multifamily units (apartment complexes and condominiums) is minima but, ideally, Google Fiber wants to service as many people as possible so, as the ring grows, so will Google Fiber access. “We also offer small and medium-size business gig packages with really cool extras businesses need to be successful,” said Johannesmeyer. She said community involvement is vital to promoting digital inclusion initiatives and education that provide groups and individuals with access to information and communication technologies. Google Fiber’s Community Impact Team works with local nonprofits to promote digital inclusion throughout the Tennessee Valley. One of those enterprises is the Digital Inclusion Fund, created at the Community Foundation with sponsorship funding from Google Fiber to make Internet access and digital education available to residents currently without access to those resources. More than $100,000 in grant money was given to high-impact programs in North Alabama this past year. “Ours is a very innovative model and we applaud Huntsville Utilities for their leadership,” said Johannesmeyer. While the mission to make Huntsville a Gig City cannot yet be stamped “accomplished” – it is certainly in full rattle-battle! 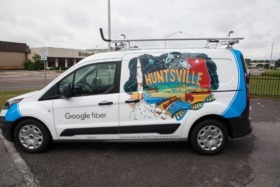 To find out if Google Fiber is available in your neighborhood or business location, visit https://fiber.google.com/cities/huntsville/. You may also submit your email address to be notified when it is available.